Every time I make a minor change to one of my old web apps it means porting the code from Aphasia 1 to Aphasia 2—so it takes way longer than it otherwise would. (And sometimes that means adding some new feature or optimization to Aphasia 2, so it could be a whole weekend project just to add some little button somewhere...) But there's pretty much nothing I like better on New Year's eve than mindless porting jobs, at least if the destination language is my own lovely creation. We have completed our Christmas 2005 journey. 900×600 version Here is a collage of weird things seen over Christmas '05. Tip for those who design the text on products: No product should ever have a word that sounds like "diarrhea" featured prominently on it, in any language, even if it claims to "moisturize" your hair. 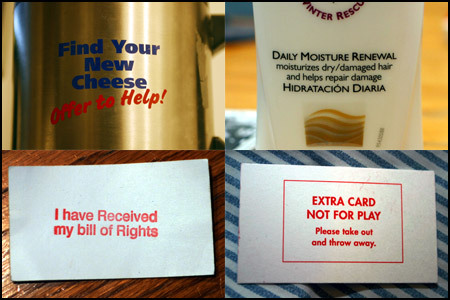 Especially if it claims to moisturize. Wow, I am in a super good mood today. First, I got a good night's sleep after getting to talk to some good friends, and I have been relaxed since sending out my proposal draft. Second, I got a nice e-mail from advisor Bob saying that the proposal looks good! So, supposing Karl also approves, that means on to the next stage, and soon, I'll be the kind of guy who is always talking about how he should be working on his thesis instead of just his thesis proposal. Third my mom and I made a nice vegetarian dinner together and then I totally won at family poker and had some delicious poker juice (Booker's) and now it is time for some sweet dreams. Ahhh. Also, I finally installed AIM-compatible IM and I am "SERVER OK" there. Feel free to disturb me at will before the novelty wears off! Happy (slightly belated) boxing day, everyone! I decided that because my thesis proposal prominently features a "box" modality of its own (alongside the heart modality, now tastefully renamed to an upside-down and backwards G), that boxing day would be a good day to submit my best draft to my advisors. I hope it flies, because I sure spent a long time on it. Actually, you can read it too, if you like. Comments are appreciated, unless your comment is to rewrite the whole thing like last time! In other boxing day news, I bought a piano. Ebay is great. This adds to the list of things making me eager to get back to Pittsburgh. But first, some sleep and a few days spent relaxing with the family and the MP3s and the non-work projects. Ahhh. PS. The blogosphere sure is boring on Christmas day, isn't it? Mike and I made it back to Connecticut! The drive went really smoothly and I even got some work done. Today, some last minute editing, some last minute shopping, and some last minute Pepe's apizza. Above is today's visual slice of middle Pennsylvania. Also this old album-a-day I recorded with Marc is sounding really good to me right now. Maybe I am just in a good mood! More people need to write songs about the heart modality so that this happens more often. Get on this forthwith! Here is an amusing anecdote about Kurt Gödel—perhaps the greatest logician to ever live—at his citizenship hearing that I had never heard before. For maximum amusement, remember that Gödel was an extremely bizarre Austrian fellow who was morbidly afraid of refrigerator gases and being assassinated by other mathematicians [pic]. Think, say, Dr. Strangelove. Those of us wishing to be remembered as insane geniuses would do well to achieve like one tenth of what he did. 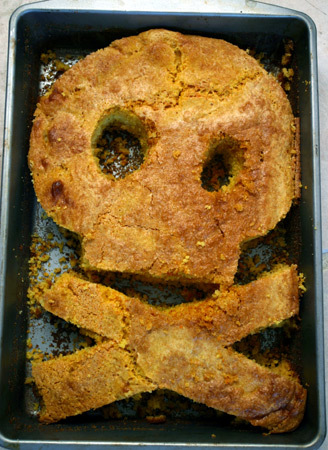 Don't even think about taking credit for my cornbread jolly roger. 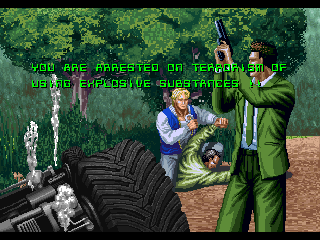 Ahh, finally, a relaxing evening. I don't particularly have any less on my plate, but at least there isn't anything due tomorrow, so I am taking the evening off to catch up on some projects and stamina. Also, it was a good day for freedom with both the Patriot Act failing to be renewed and a bit of a shake-up over the kind of spying that everybody sort of already knew was going on (see above). It doesn't look like I'm going to actually finish tonight, but I guess I already knew that, and already told my advisors that it would happen. Oh, well. Man, this stuff always takes so much longer than I think it will! I made a lot of progress on this thing, though, and I can probably finish it before heading home for break. I had a great weekend! And now it is time to go back to work. I'm 12 pages into my thesis proposal, taking care to be as coherent as possible, and I expect to develop blistering callouses on my fingers from typing so hard over the next few days. I just served up my last Twelf tutorial for the week. This freelance logical framework tutor is now closed for the holidays (by which I mean CSD Black Friday). "SOLD OUT - Cheap viagrna for sale"
Today's radar game is one that exercises your powers of description. Sick of mere adjectives to describe the weather ("It is cold today"), hack weathermen and -women in 1992 turned to the use of flowery adverbs. How is the weather? It's bone-chillingly cold. When I'm walking outside and it is at the extremes of hot or cold, the appropriate adverb "bone-chillingly" (for cold) or "oppressively" (for hot) always sets firmly in my brainpan, sort of like how some obsessive-compulsive persons count each step as they walk. But what if, some day, I'm thinking, Boy, today is bone-chillingly cold and then the next day it's twenty degrees colder? I don't even know any adverbs that imply more freezons per unit volume. So here I solicit the help of my fine radar-readers, a fun game: Please respond with your most extreme adverbs for describing both hot and cold weather. Your answer must be in the form of an adverb. Adjectives are too weak. To get the snowball rolling, I will start with one: paint-strippingly cold. I am a bit more relaxed because the network is back and my thesis proposal is dried out, and I gave the introduction to my advisors (who have had really high standards as respects writing recently) who actually said that it was good. I still have a lot of work ahead of me, but a bit less despair. As always I gleefully accept non-functioning replicas or drawings of these objects, if made lovingly by hand. Also: do they make ice crampons for running shoes? If not, then that is my new invention. Because, yikes. Poster Party 200X went really well. It took longer than I thought it would, as usual, but I made twelve different designs and posted them up around campus and if I am lucky, some people will actually see them before someone who does not believe in campus beautification through art tears them down for violating the Draconian poster policy or whatever. Jason also made a series of lovely nonsense/abstract designs. William pushed the limits of type theory / 90s pop crossover obscurity. Adam almost got a very nice vector version of Tutorial 5: Rough but its complexity was too high for Illustrator's tiny brain and our hungry stomachs. Strangely, there seemed to be some kind of competing confusing-poster campaign going on at the same time... but our posters were in color. Ha! In what is becoming a bit of a radar cliche, I say again, "Wow, busy weekend!" I feel like a real socialite (that means socialist with 40% fewer calories) having been invited to so many events yesterday. In truth, I felt a little bit stretched thin (that means drawn and quartered) because there were so many people around that I wanted to interact with, but not enough time to actually do it. On the other hand, like I said when America Online was forced out of business permanently in 1998 because they had too many subscribers, if you're gonna have a problem, I guess this is a pretty good kind of problem to have. The pasta we made at Spoons's house was also stretched thin! The cornbread at the Cottage was also quartered! The nog at Erika's had also 40% fewer calories! 1200×448 version Phew! Well, that took a long time, but here is my submission for the Pittsburgh "Art in Transit" project. Pittsburgh artists are having their work displayed in place of advertisements in buses around town. I'm not sure when they'll be displayed, but since I passed a qualifying round earlier, I understand that this is pretty much guaranteed to show up in buses around pittsburgh. Please let me know if you see it! Click on the image for a bigger (but still not very big) version. If you want to zoom way in, you can also try this 7.7 mb TIFF (16,800 x 6,600), which will probably crash your computer or this 53kb flash file which looks better anyway.